Despite the fact that some of us haven’t even experienced Spring yet and are still stuck in a permanent Winter the PANDORA Summer 2018 Collection is on its way! Summer 2018 is all about going bohemian! So add some braids in your hair, dust off your leather sandals and add lots and lots of tassels! A silver feather, anchor and conch shell dangle from a smooth heart at the centre of the ring. The conch shell also has a tiny heart stamp which is really sweet! 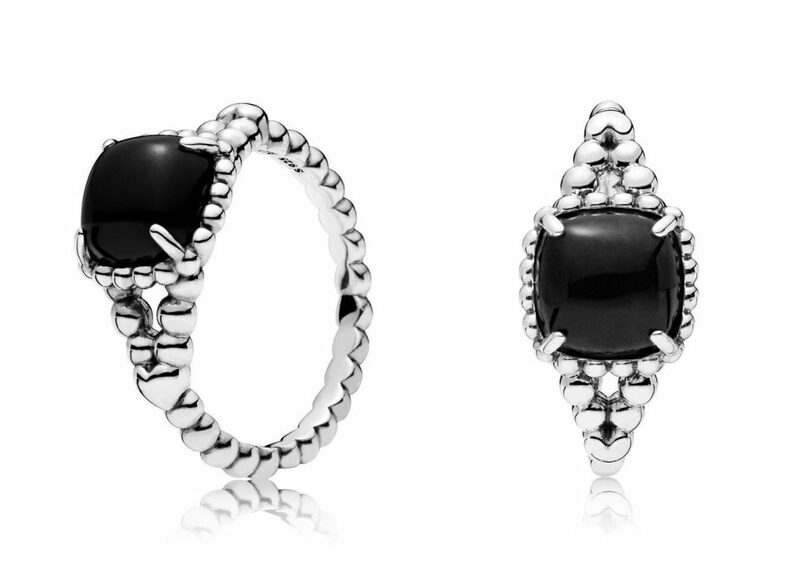 This simple design, set with a stunning black crystal cabochon, is reminiscent of older PANDORA rings. I really like the beaded detail around the ring and the little heart detail at the side. The Vibrant Spirit Ring is also available with this gorgeous ‘scuba’ blue cabochon-cut stone! 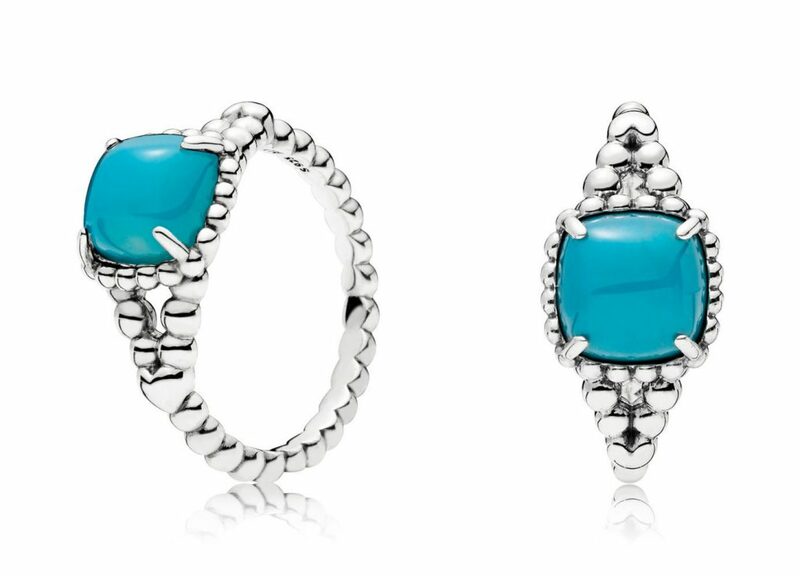 I have always love turquoise and silver together and this ring is a perfect example of how good they look together. The style, stone and colour combination make me think that it could be a vintage ring that you discovered in a hidden back street antique. I love the design of this ring and with its chain like band it reminds me of a friendship ring. 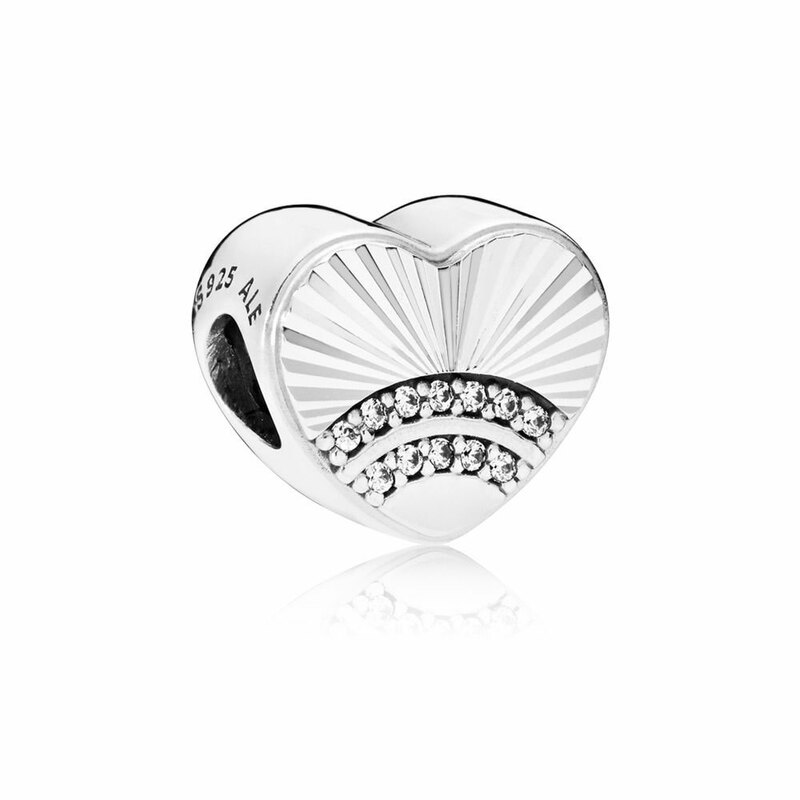 The little heart in the middle is set with a clear cubic zirconia stone. A logo nameplate sits at the base. The Spirited Heart ring is available in three different colours; clear, pink and blue. The blue crystal version is my favourite! I am sure that the pink version of the Spirited Heart ring will be popular with younger PANDORA fans. Sometimes I wonder if I have accidentally gone back in time. Last year we had PANDORA’s equivalent to friendship bracelets, this year choker necklaces made a come back and now we have ear cuffs again! Am I 15 again? 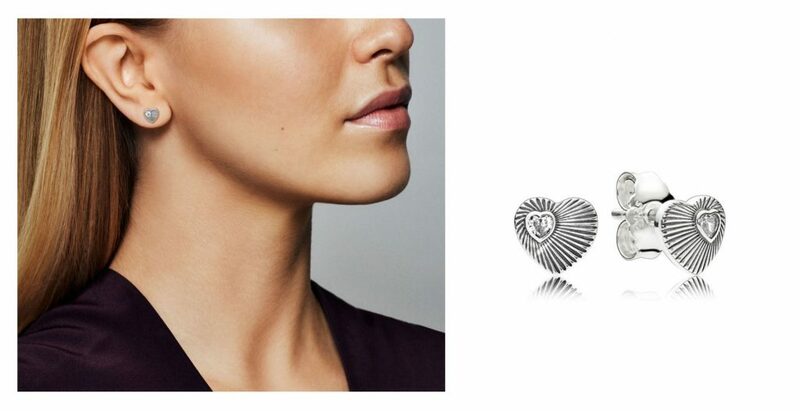 The new Open Heart ear cuff is also available in sterling silver. 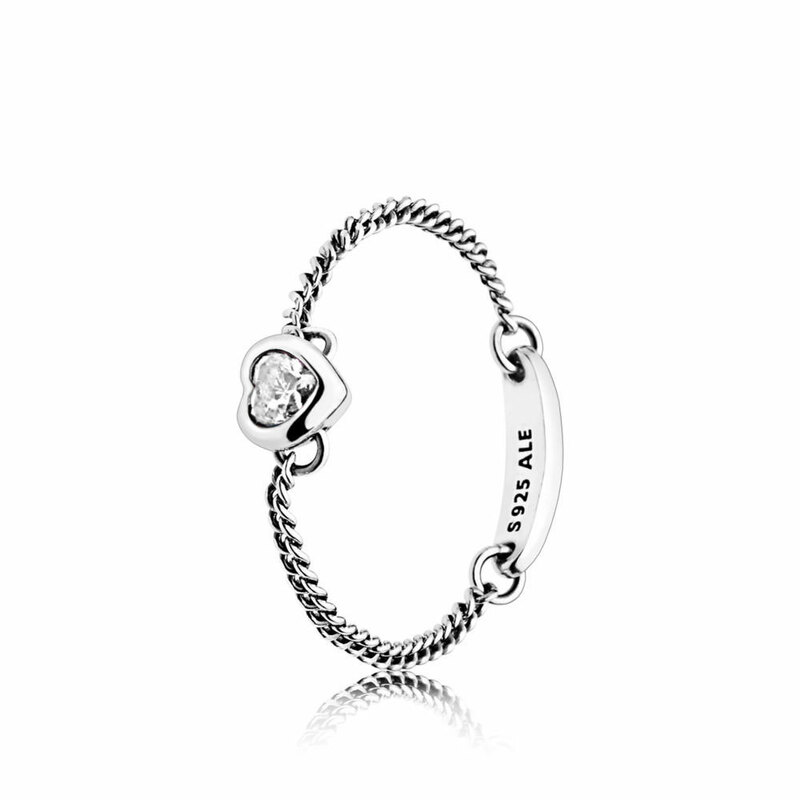 PANDORA have also produced a PANDORA Rose version of the Open Heart Cuff. 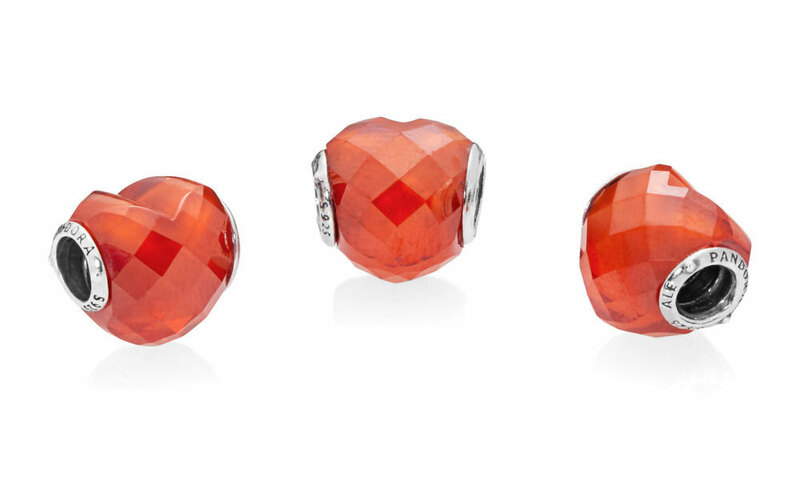 The PANDORA Vintage Fan Earring have a art deco feel to them both in colour and style. 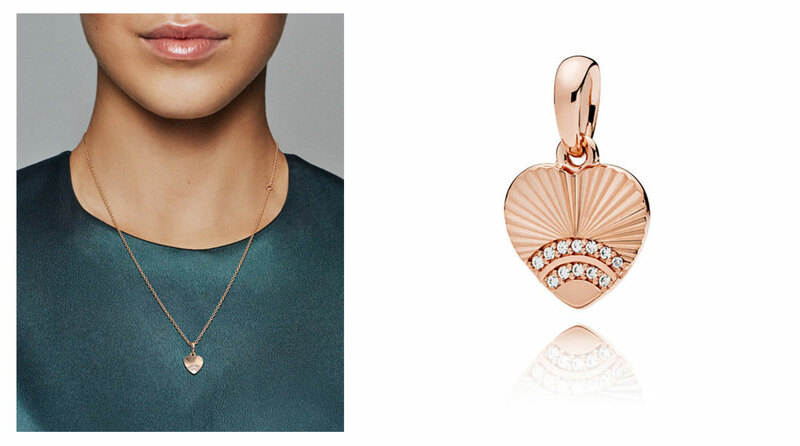 At the centre of the earring is a clear cubic zirconia heart. 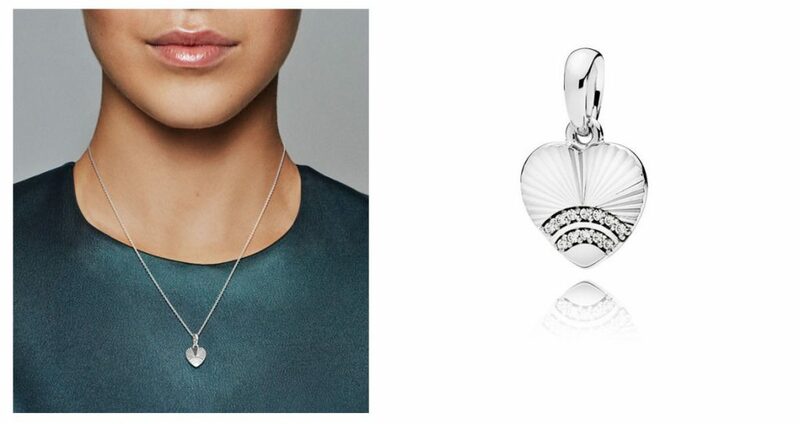 The silver version of the Vintage Heart Fans are a heart shape rather than a circle. I like to wear two studs on one ear and I think both versions would look really lovely next to each other. These pretty hoop earrings are perfect for the boho trend this Summer. 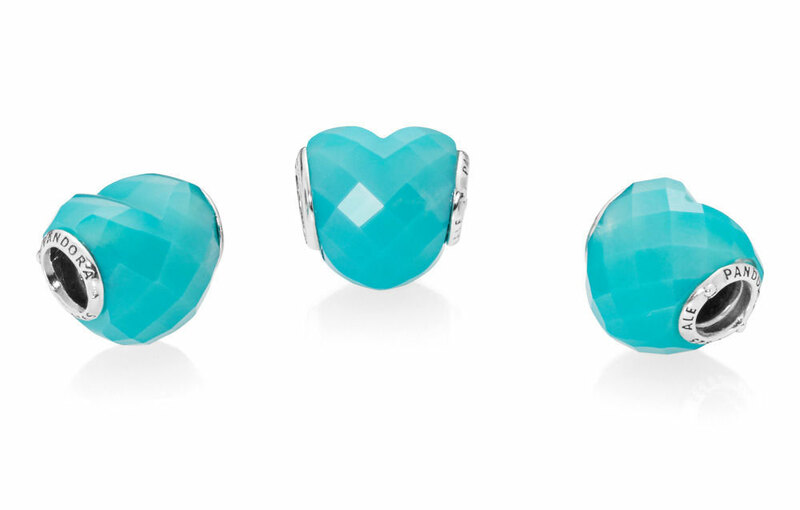 The silver hoops are decorated with delicate beading and a silver feather and turquoise enamel heart that hang below. PANDORA fans went a bit crazy over the PANDORA Woven Fabric Choker last year and I am interested to see what the response will be to these new Leather Chokers. 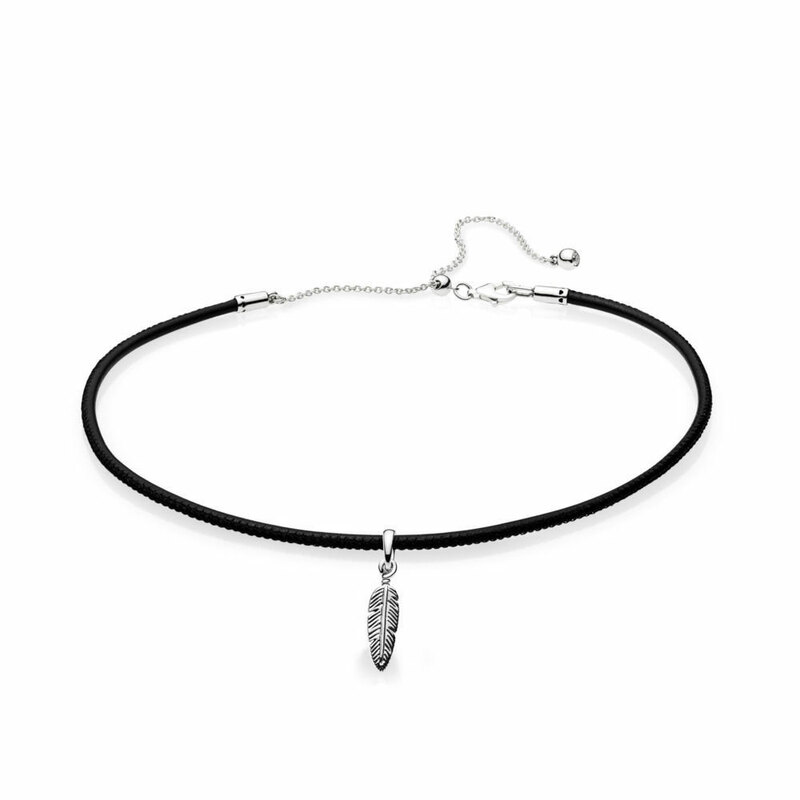 The Black Leather Choker has a sliding clasp with a clear cubic zirconia stone on the end and is 38 cm. 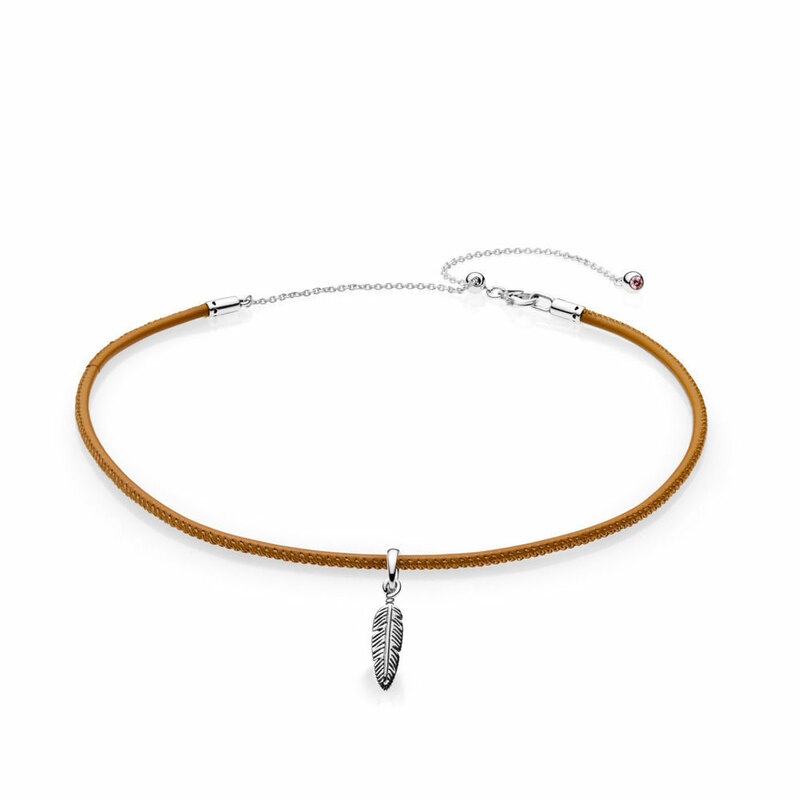 The Golden Tan version of the Leather Choker has a pink cubic zirconia stone at the end of the sliding silver clasp. 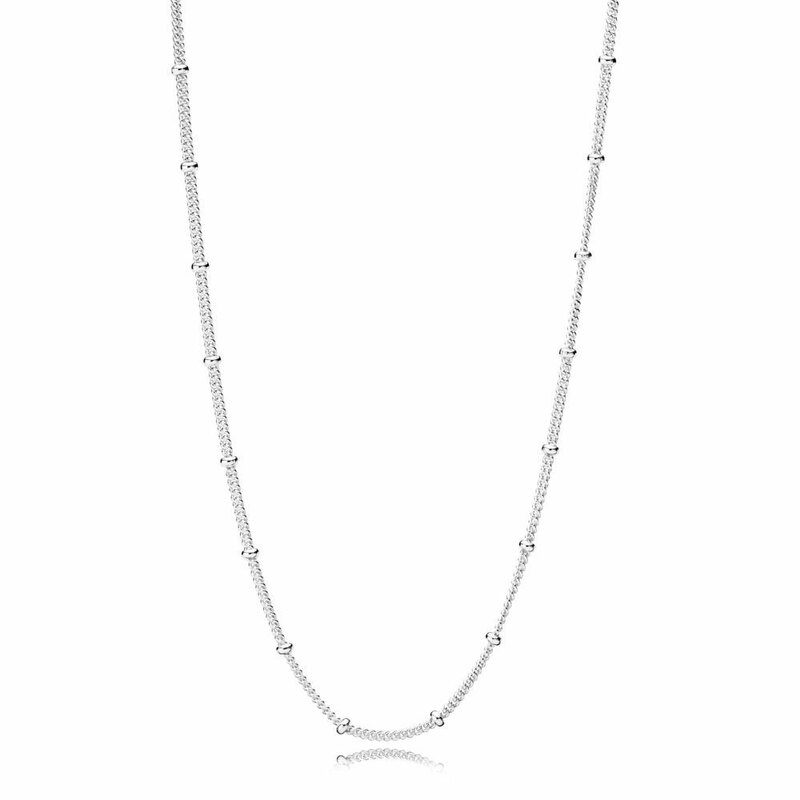 This delicate 70cm necklace is interspersed with little silver beads. The overall effect is very pretty and would look stunning with any type of pendant. The chain features a sliding clasp that allows you to adjust the length according to your style. This wonderful necklace has a charming layered look which looks relaxed yet elegant. 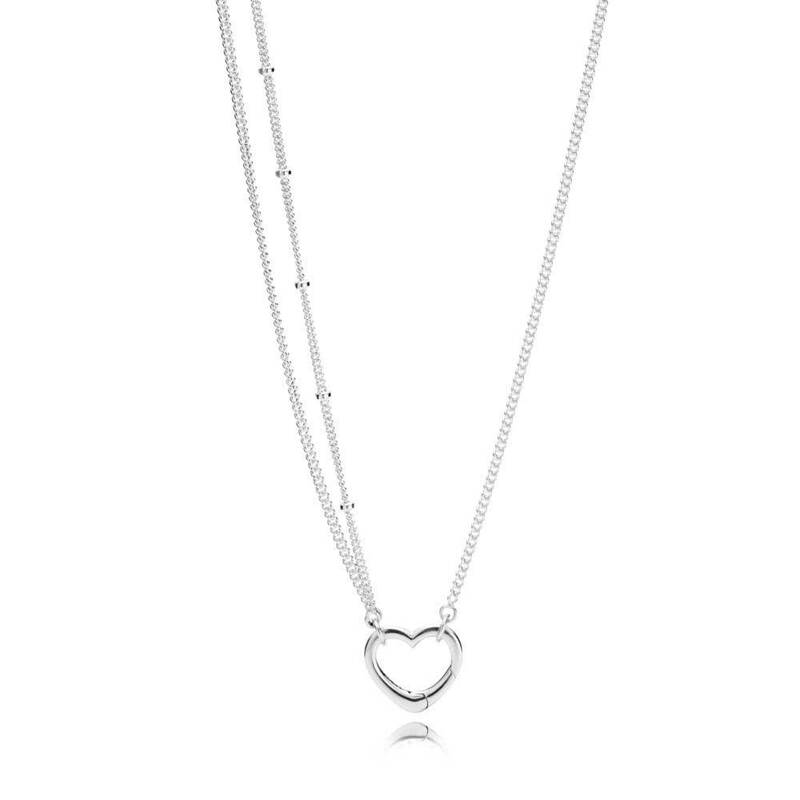 It has been a while since I have bough a PANDORA necklace but I am seriously tempted by this one. The Sparkling Strand Bracelet is also now available with rainbow coloured cubic zirconia stones that are perfect for Summer festivals! 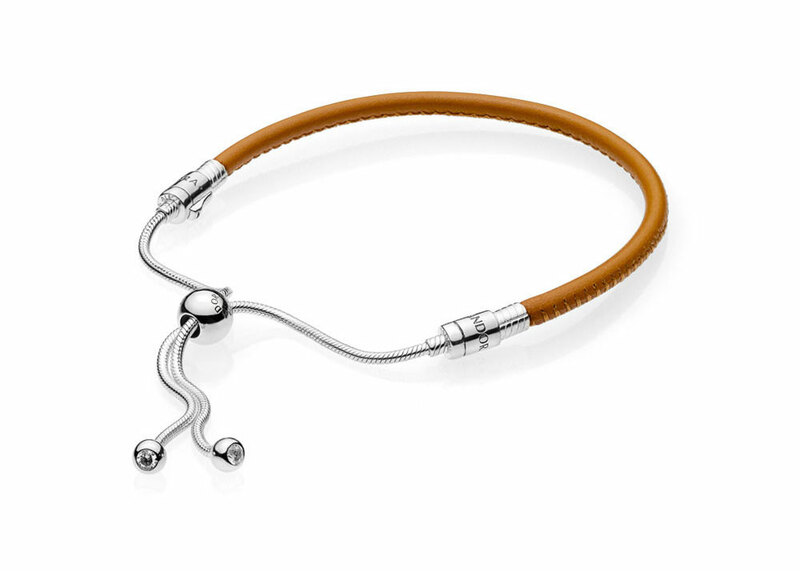 It features an adjustable bolo clasp for the perfect fit. 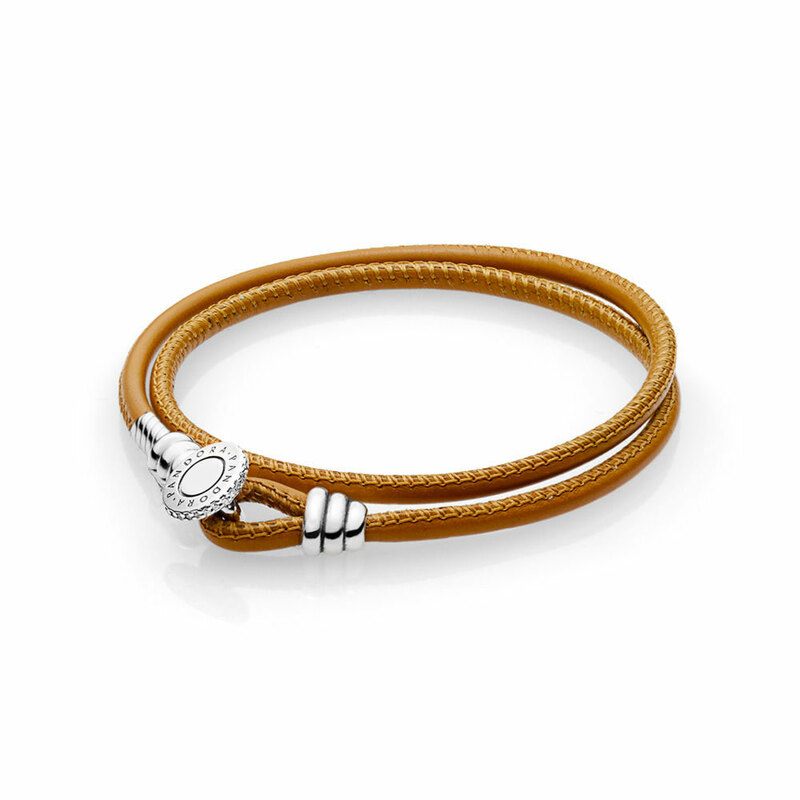 There is also a Golden Tan version of the new PANDORA Sliding Leather Bracelet. The new vibrant double leather bracelets are the perfect summer accessory. They look amazing with a selection of your favourite charms or layered with other bracelets for an eclectic style! 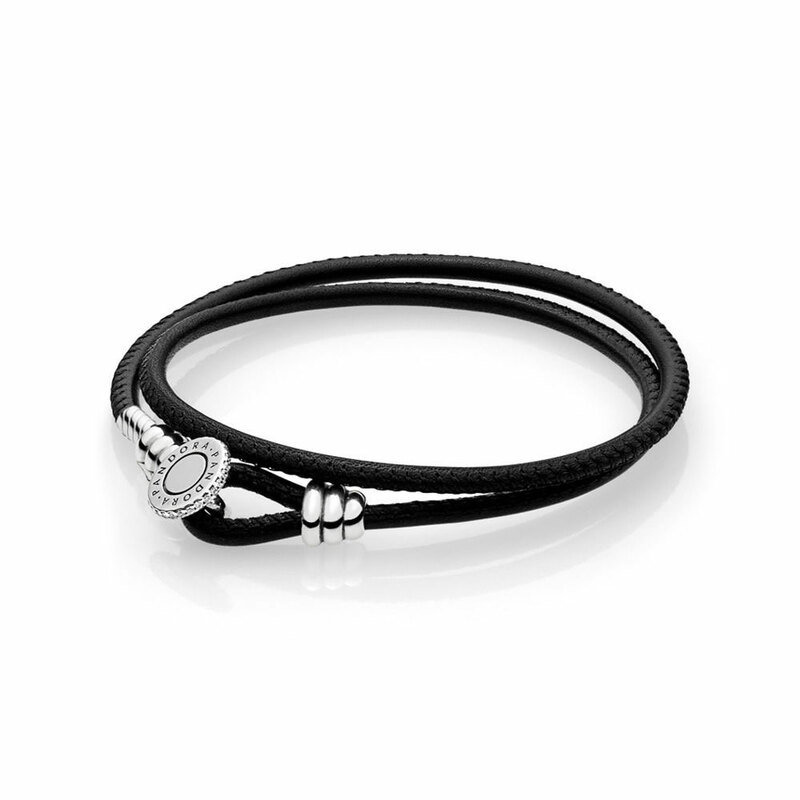 The new loop style clasp on the Double Leather Bracelet is engraved with the PANDORA logo and set with glittering stones for an extra detail. The Golden Tan version of the new Double Leather Bracelet is my favourite and I think it looks amazing paired with the turquoise tassel! 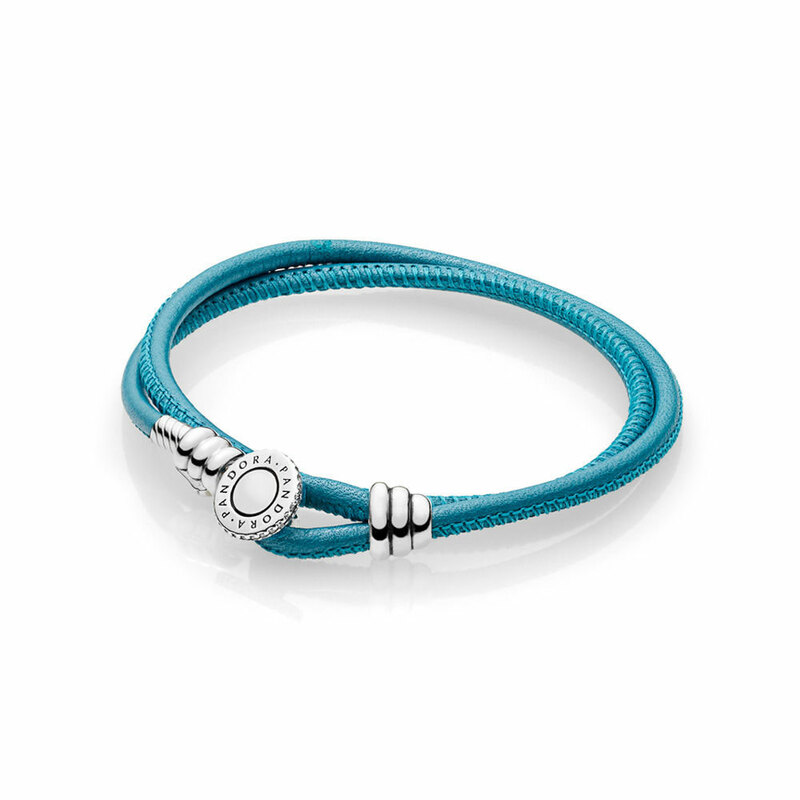 The Turquoise Double Leather Bracelet looks gorgeous with the silver clasp and the stitching detail stands out beautifully. The PANDORA Rose Fan of Love Pendant features two arcs of clear cubic zirconia stones set over the textured lines. The Fan of Love Pendant is a delicate charm with a pretty vintage feel which looks very elegant worn alone on a necklace. The Summer hippy vibes continue with two new Amulet Pendant Charms. The little beaded detail is actually formed with red enamel although it resembles little stones. Once again in the recent style there is a little heart stamp on the top of the Amulet. 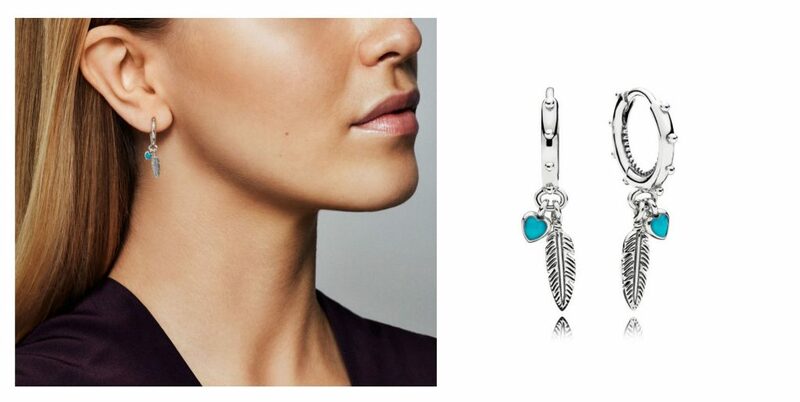 The turquoise version of the Amulet Pendant features turquoise enamel beading. 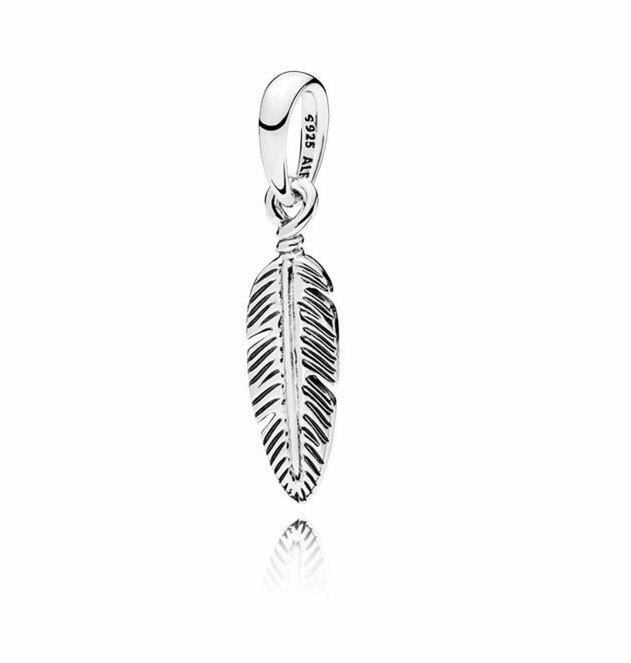 This pretty Spiritual Feather would look charming on the new PANDORA Leather Bracelets with a tassel or two! 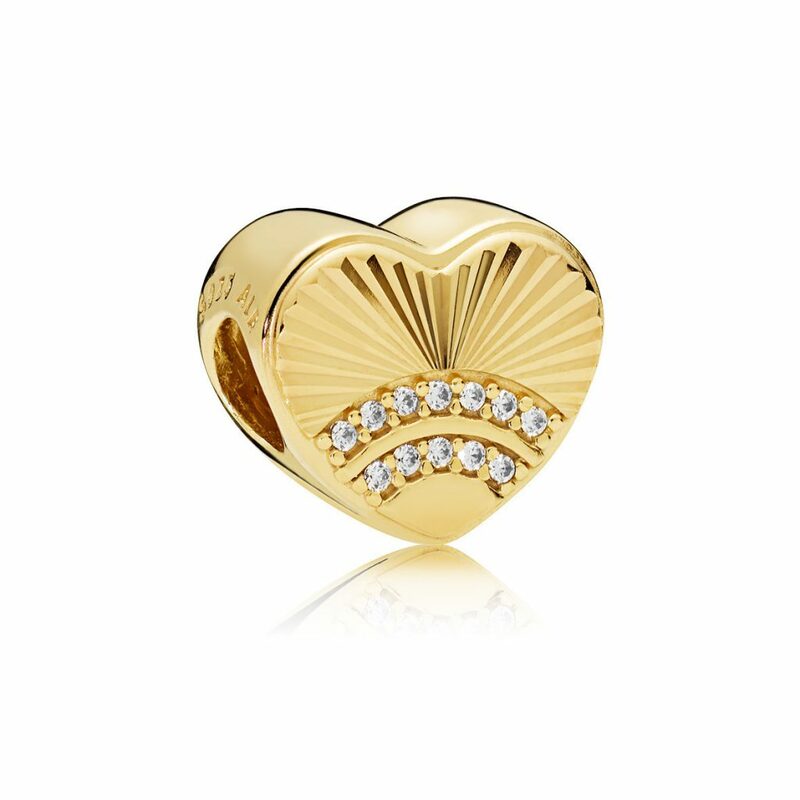 I love the combination of the gorgeous colour of the PANDORA Shine 18k gold plating with the vintage style of the Fan of Love Charm. I have definitely caught the PANDORA Shine buzz as the silver version of the Fan of Love Charm just doesn’t grab me. 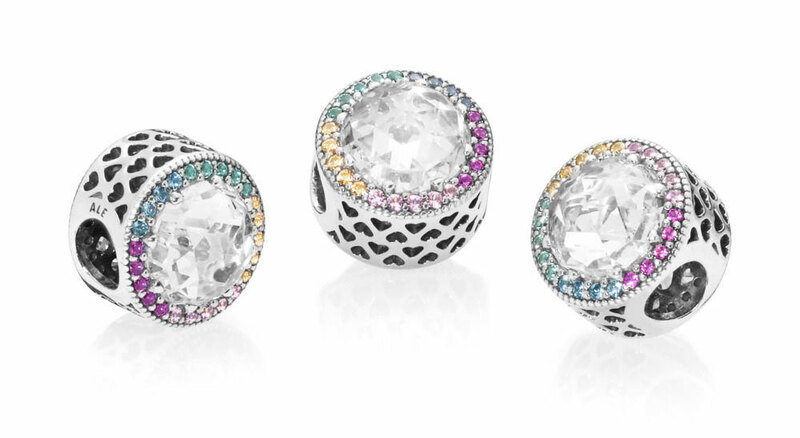 The pretty rainbows from the Spring collection are slipping into the Summer collection too! 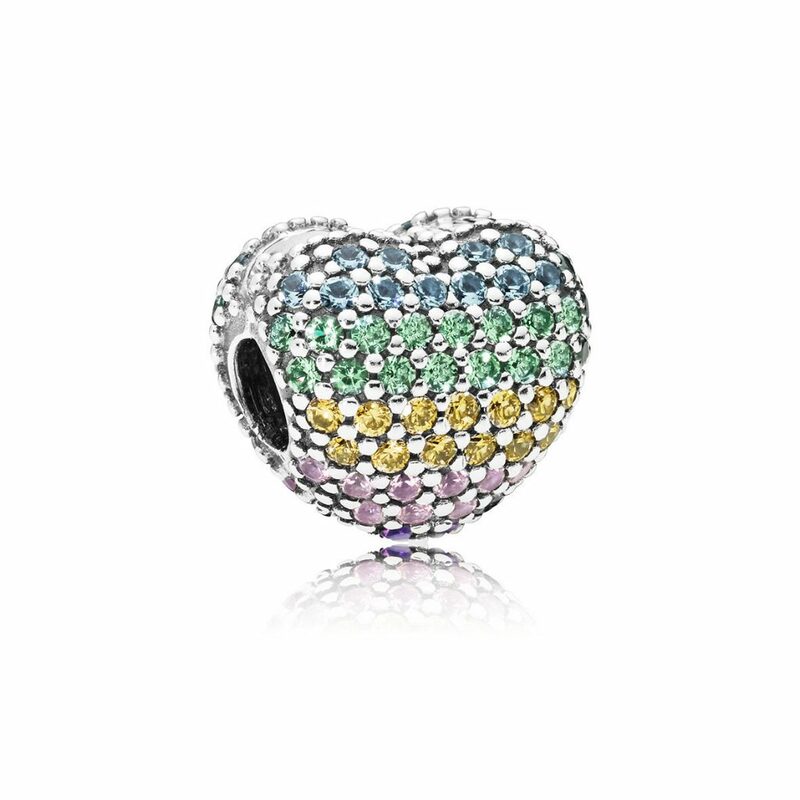 Here we have a multicoloured version of the Radiant Hearts Charm with a clear cubic zirconia stone at its centre. Remember back in January when I predicted that there would be more colour versions of the Shape of Love charm? I was right! I love the vibrancy of the blue crystal version. Although I prefer the blue version, the Orange Shape of Love charm would look really fun paired with the vivid turquoise colour. I really liked the mosaic PANDORA Essence Compassion charm but I love this mosaic Moments design even more! It is fresh and summery but not over powering. It’s a definite for my Summer 2018 wish list. I really hoped that the emoji charms had died but I am afraid one snuck into the Summer 2018 collection! 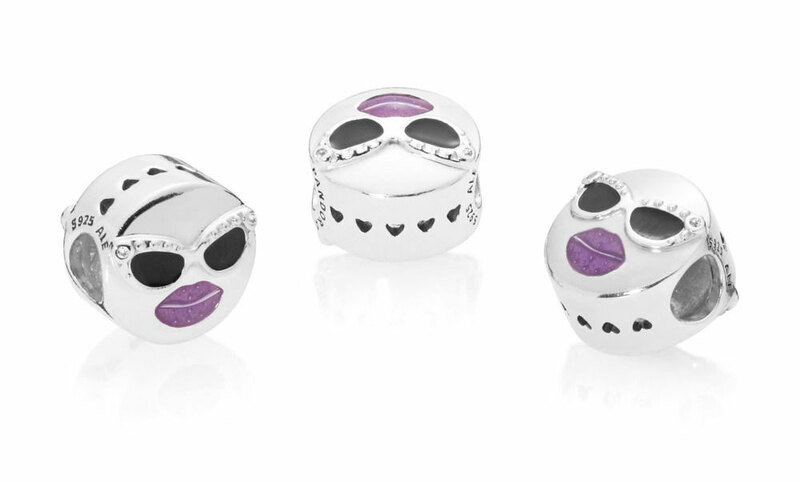 The Stay Cool Charm has black and purple enamel and cubic zirconia accents. The quirky Drink To Go Charm is a must have for coffee lovers! The take out cup features the PANDORA crown logo in a pink enamel heart. On the reverse is the message ‘Take a break’ in an italic script. 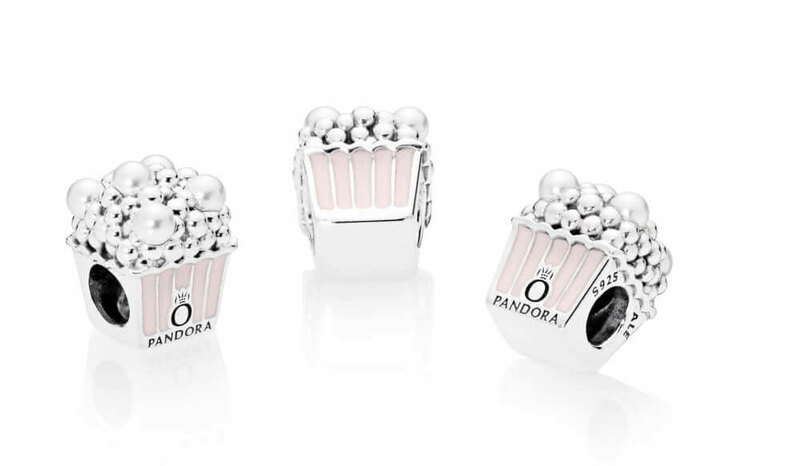 I love that PANDORA is exploring new charm themes and style and look forward to see what is released in future collections. The popcorn bucket is filled with white crystal ‘popcorn’ pearls and decorated in pink and black enamel. The PANDORA logo on one side of the carton. Although this is quite a fun idea, the delicious popcorn looks a bit too much like soap bubbles to me! In keeping with the 60s bohemian and hippy fashion trends we have a fun charm which is based on the LOVE pop art sculpture by American artist Robert Indiana. There is a love heart in place of the letter ‘o’ and multicoloured cubic zirconia stones and crystals highlight the design. 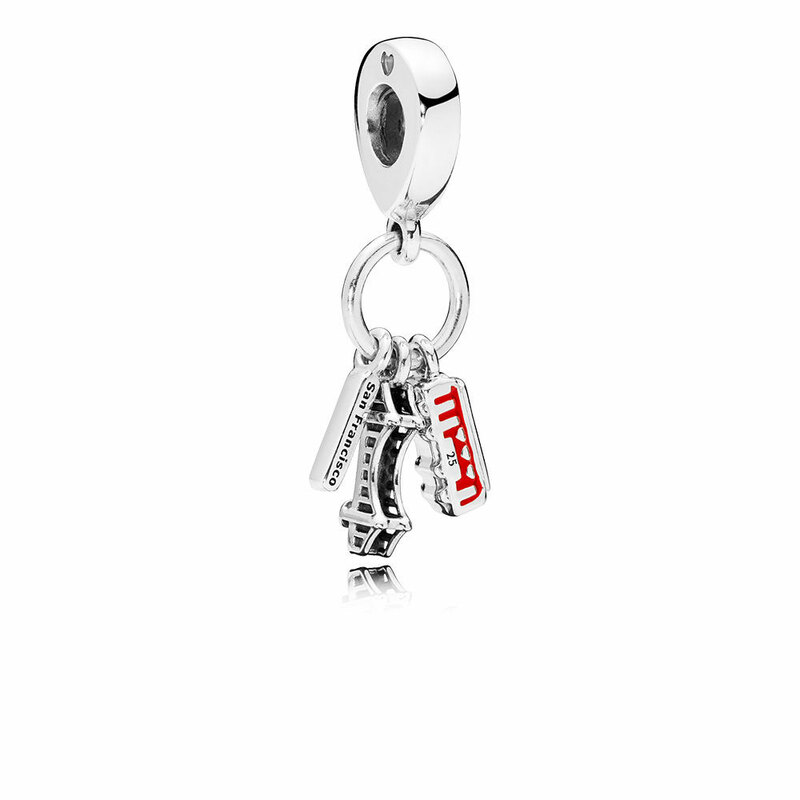 This charm is so much fun it has made it onto my wish list! 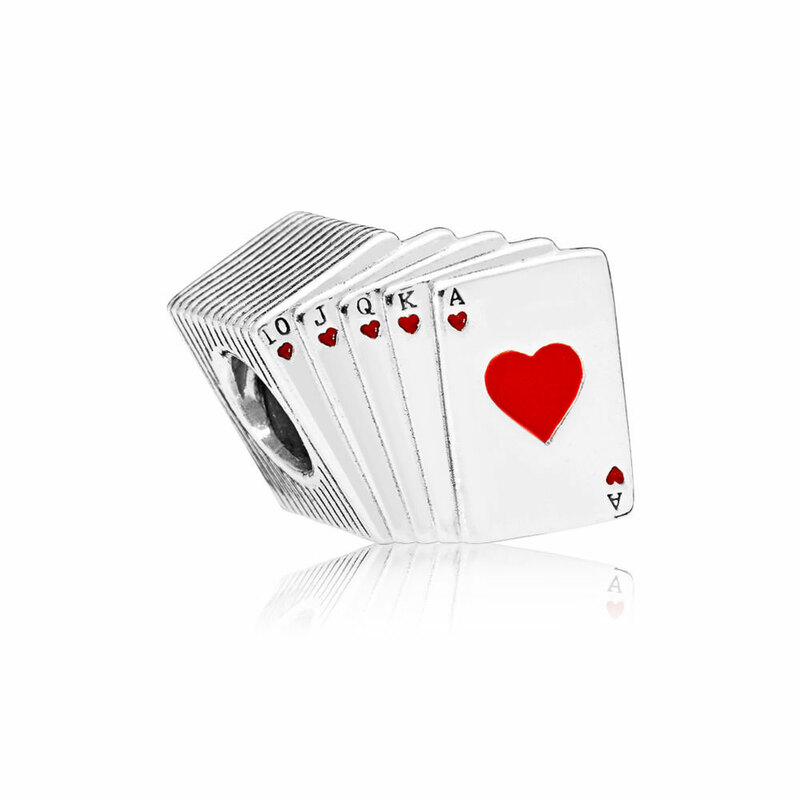 The Playing Cards charm features red enamel details on a flying pack of cards with a royal flush on the top. The unusual Compass Rose charm has a pretty shimmering silver enamel disc and an ornate compass design with a bright blue crystal at the centre. On the reverse of the charm is the sweet message ‘Follow your dreams’ and the bale of the charm features a tiny heart stamp. The Compass Rose charm would look cool on one of the new PANDORA Leather Bracelet and it would make an amazing gift for someone about to go off on an adventure or start a new part of their life’s journey. 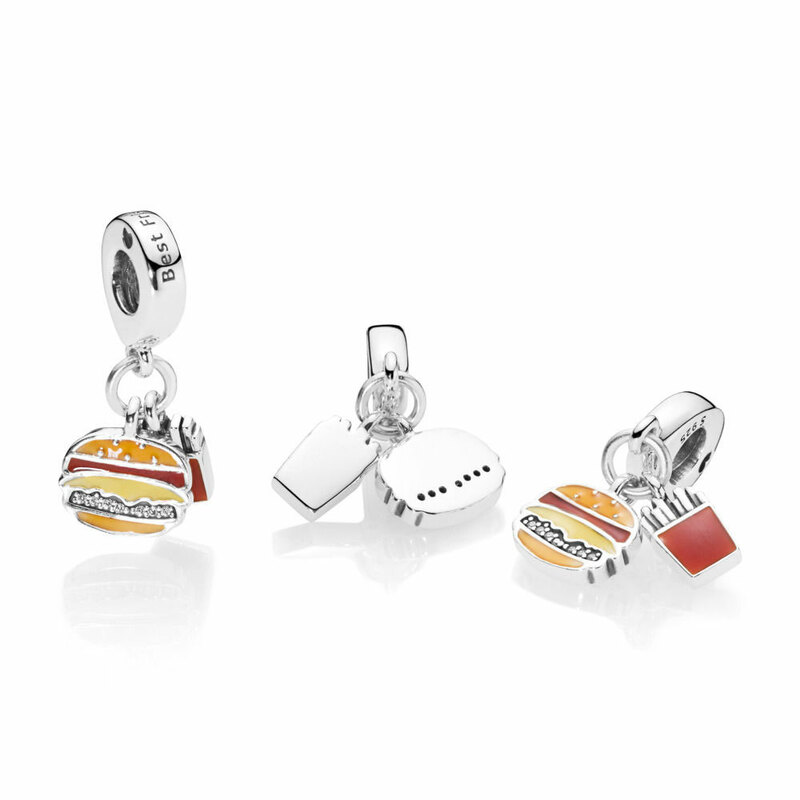 Continuing the travel theme, PANDORA has produced a selection of new city highlights charms. I imagine more cities will be released in the future. The New York Highlights Pendant includes an apple, the Statue of Liberty and a yellow taxi cab. The San Francisco Highlights Charm includes a little tag with the name San Francisco, a mini Golden Gate Bridge and a little red enamel trolley (thank you for the help I received to identify that!). The common Coquí frog, the National animal for Puerto Rico, makes a wonderful souvenir to remember the beautiful island. A back plate is decorated in the Puerto Rican Flag colours; blue, red and white. It seems that the PANDORA designers have enjoyed creating some interesting charms for the Summer 2018 collection. 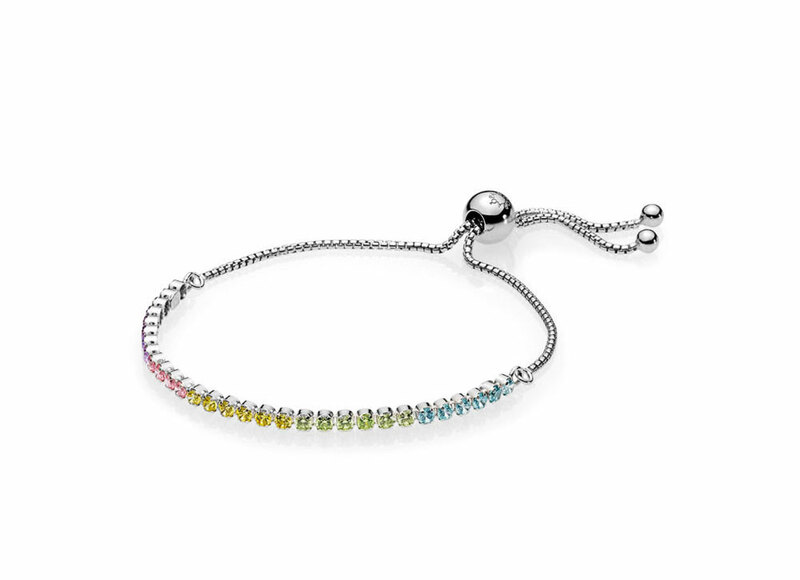 The Colour Wheel Charm is really fun and would look cute on a Disney themed bracelet. 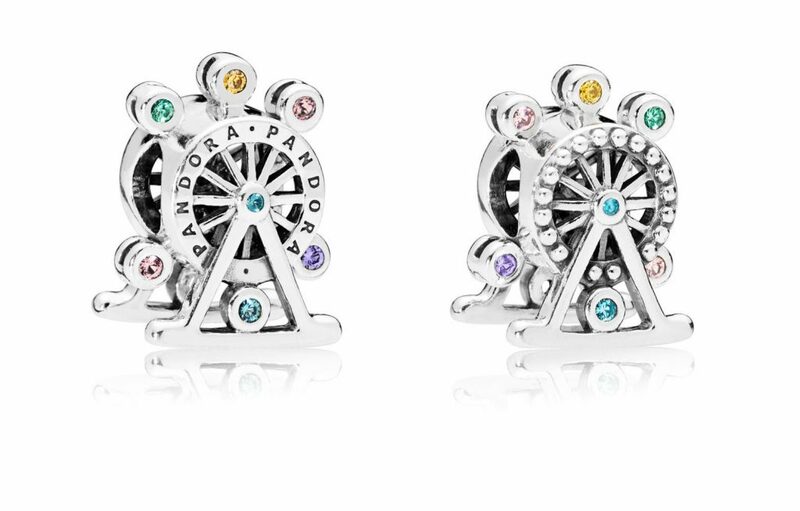 Each of the carts on the wheel has a different colour crystal or cubic zirconia stone and ‘PANDORA’ encircles the centre of the charm. A floral circular design features a little heart at the centre and three delicate silver feathers hang beneath. 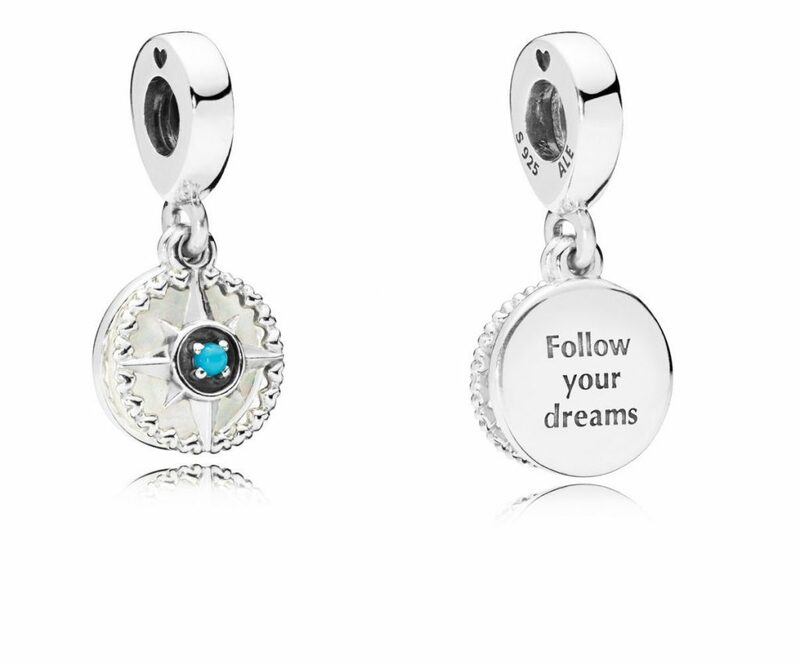 The message ‘Follow your dreams’ is engraved at the top of the charm. 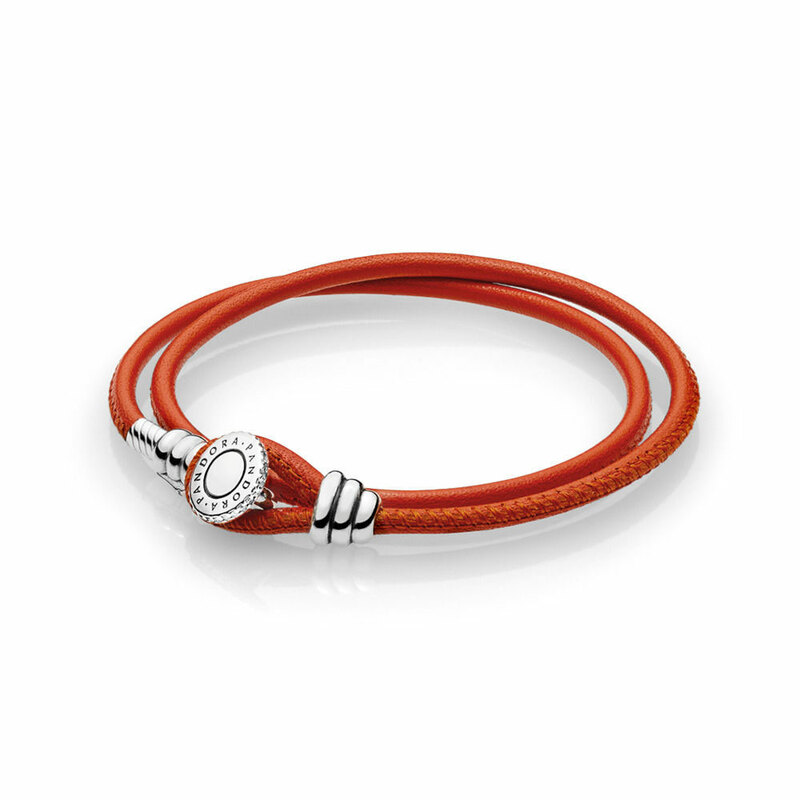 The Spiritual Dreamcatcher would look charming on the new PANDORA Sliding Leather Bracelets. The pretty charm with its nautical feel has a disc with the message ‘Anchor yourself to someone special’ and a mini anchor with two red enamel hearts. 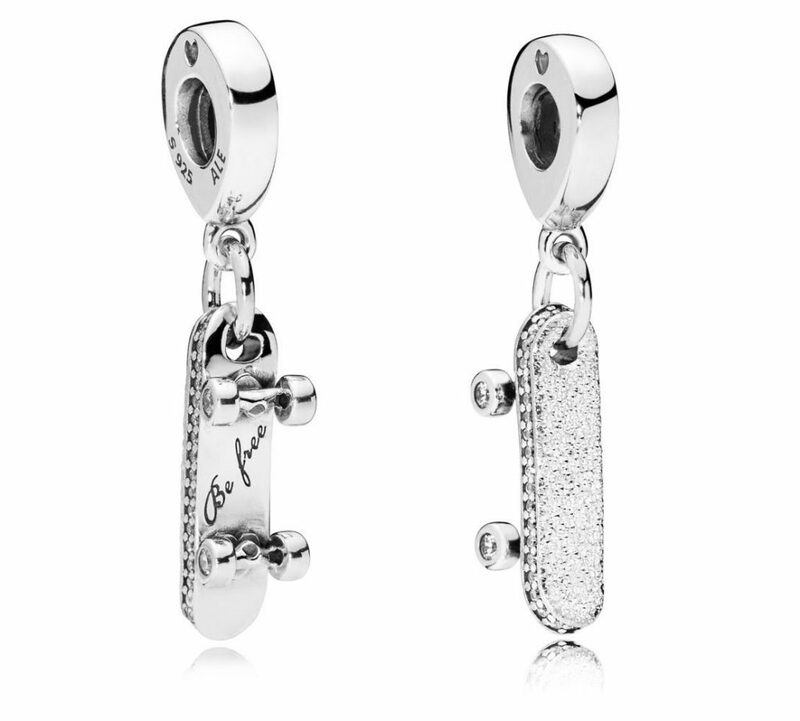 This cute little skateboard charm has a texturised board with clear cubic zirconia stones set around the edge and at the centre of the wheels. Beneath the board is the fun engraving ‘Be free’. The bale is the new style which is slightly oblong and includes a mini heart stamp. 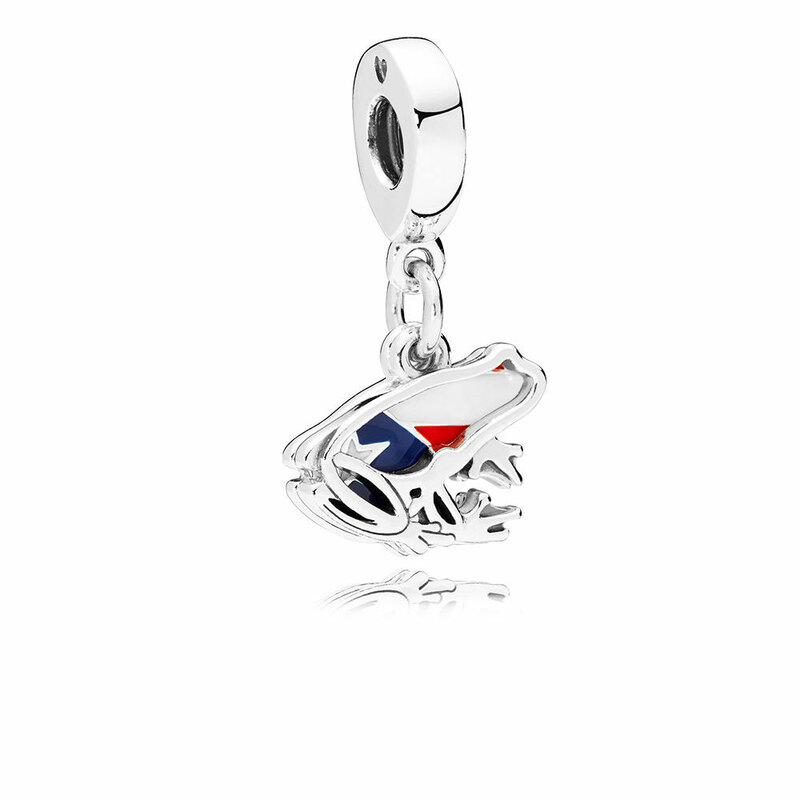 As Burger and Fries are a classic combo this pendant charm has been designed to symbolise friendship. The top of the bale has the inscription ‘Best Friends’ and the tasty food is decorated with red, orange and yellow enamel and a filling of cubic zirconia stones. 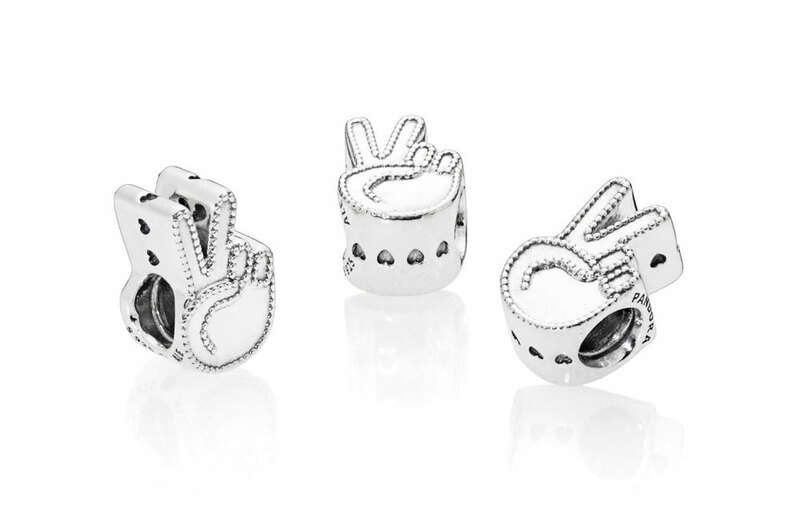 Following on from the pop art style Love Charm we have a Peace Charm with a 3D hand peace sign. 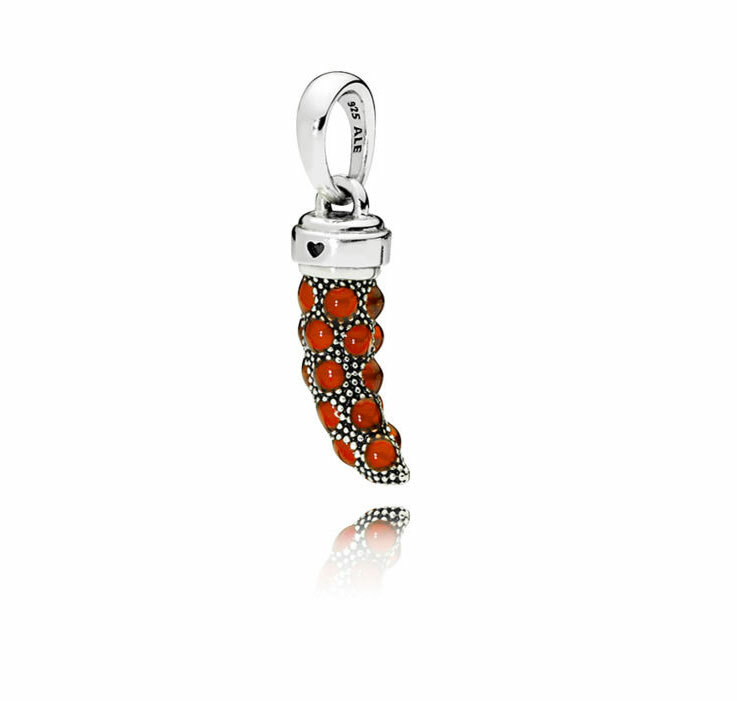 The beaded edges of the charm provide a interesting texture. 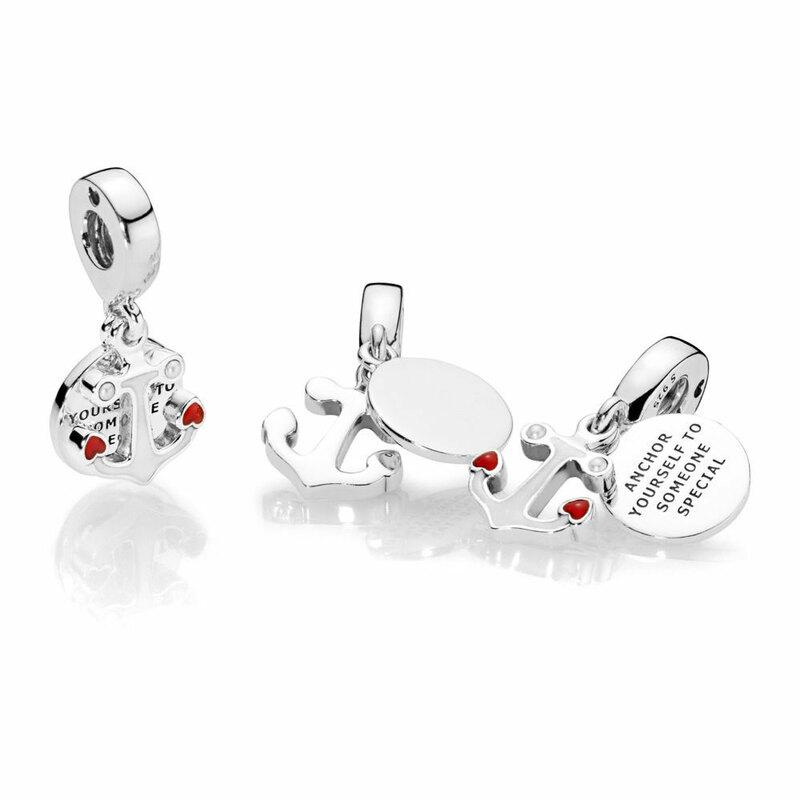 Miniature stamped hearts adorn the end of the charm. 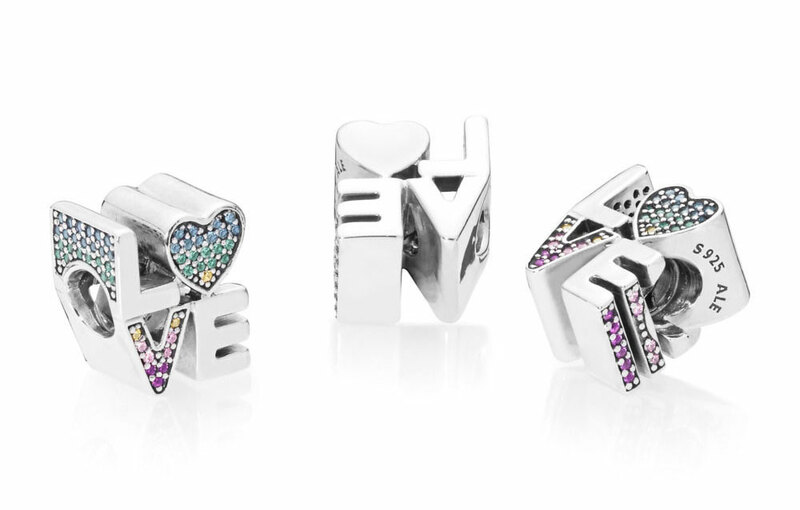 The rainbow coloured Open My Heart Clip would look cute paired with the new Love Charm. The Arcs of Love Clips all include a silicone grip on the inside, making them ideal for use on the Smooth Bracelet or Leather Bracelets. I quite like this new Blue Crystal version and would like to see it in real life to get a better idea of the colour. 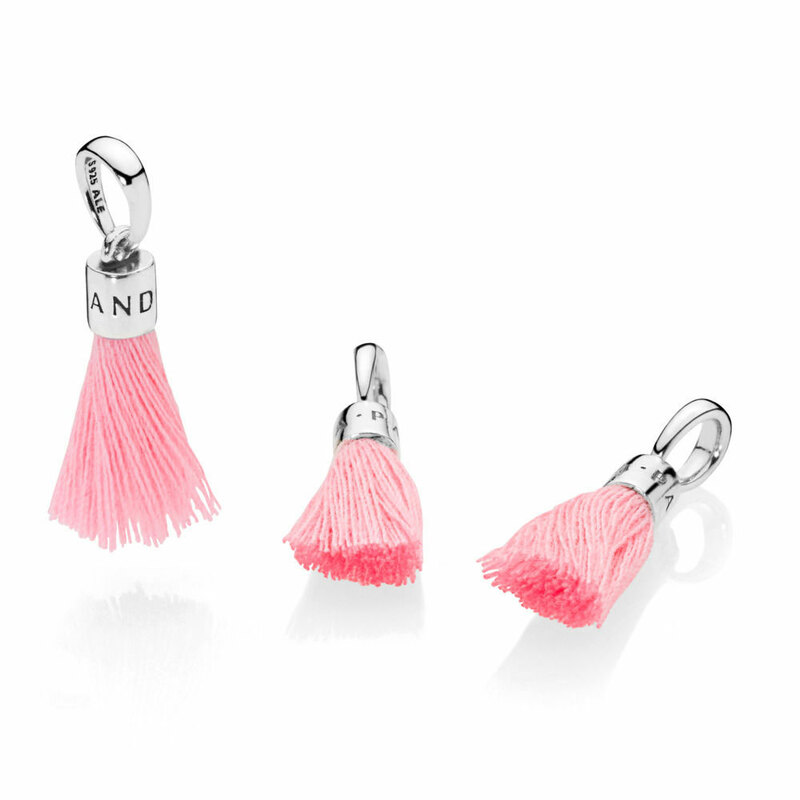 Tassels are THE Accessory for 2018 and PANDORA have got it 100% right with these bright fun Tassel Charms! 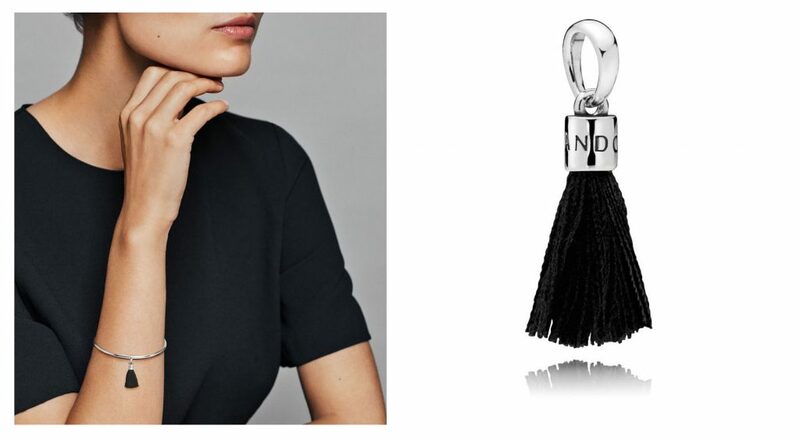 If in doubt, add a tassel! The PANDORA Summer 2018 Collection is available from our preferred online PANDORA retailer BeCharming.com. 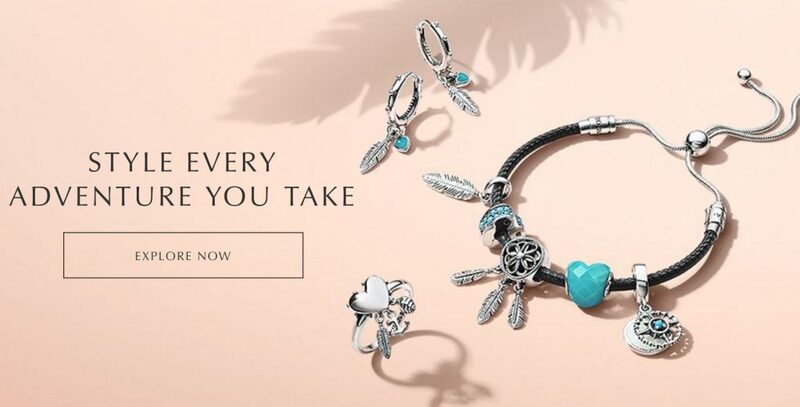 I am really pleased with the direction PANDORA is taking so far in 2018 and the Summer collection is has a nice mix of unusual and fun charms along with an assortment of cool relaxed Boho bracelets and charms. 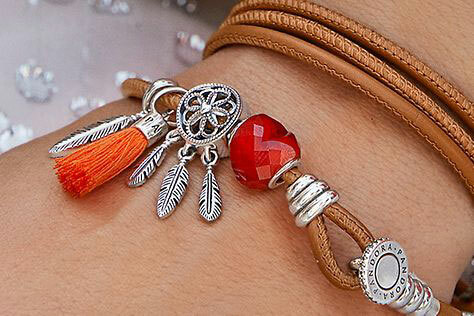 I really love the bright orange and turquoise and the Shape of Love charms and Tassels will be on my Summer wish list along with the cute Love Charm. What are your favourites from the PANDORA Summer 2018 Collection? Let us know in the comments below! Tassels are the future! I need some tassels! 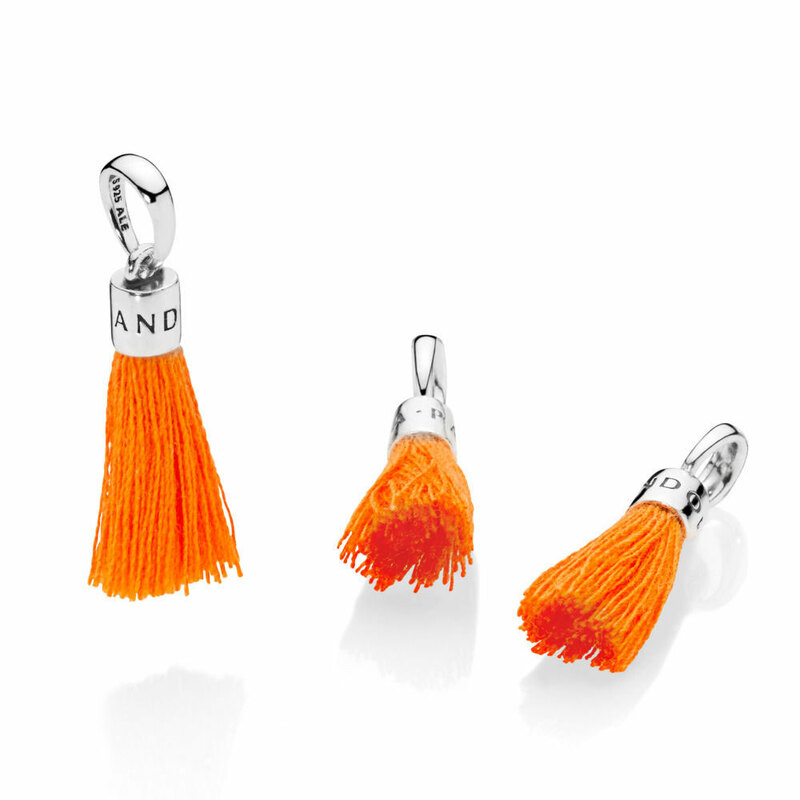 I am guessing you are a fan of the tassel charms?! I think they are quite fun and I like the blue and orange options. They’ll look great with the leather bracelets. Thank you for commenting and sharing your enthusiasm! Hi! The I love Puerto Rico 🇵🇷 symbol is the representation of what we commonly call a “coquí”, that is our native little frog, and also have the colors of our flag. The red item on the SF charm is a trolley! Thank you so much for helping me! I don’t think I was going to get that at all! Do you like any of the Summer 2018 charms? I live near San Francisco so it was easy to spot! I’m excited for the dreamcatcher and the new leather bracelets plus several other pieces. The bridesmaid charm is surprisingly timely as I’m getting married this year and my color is purple! I find I’m getting excited for collections again after a few rough seasons. Except for the emojis. I don’t get the allure. Congratulations on your upcoming wedding! That’s great that PANDORA has used your colour scheme! Do your bridesmaids have PANDORA bracelets? I’m really not keen on the emoji charms either. I didn’t like the lip charms in the Valentine’s 2018 either. The more recent collections have made me much more excited for PANDORA again. The summer collection is gorgeous. 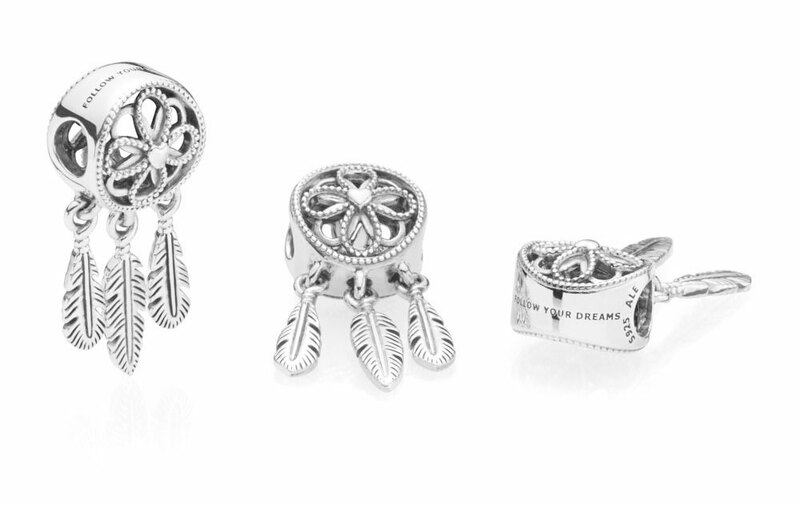 The tassels and the dream catcher charm is a must have for me. Beautiful. Meaningful charms. I love it. Wonderful. Cant wait…. I’m so pleased you like the Summer Collection! 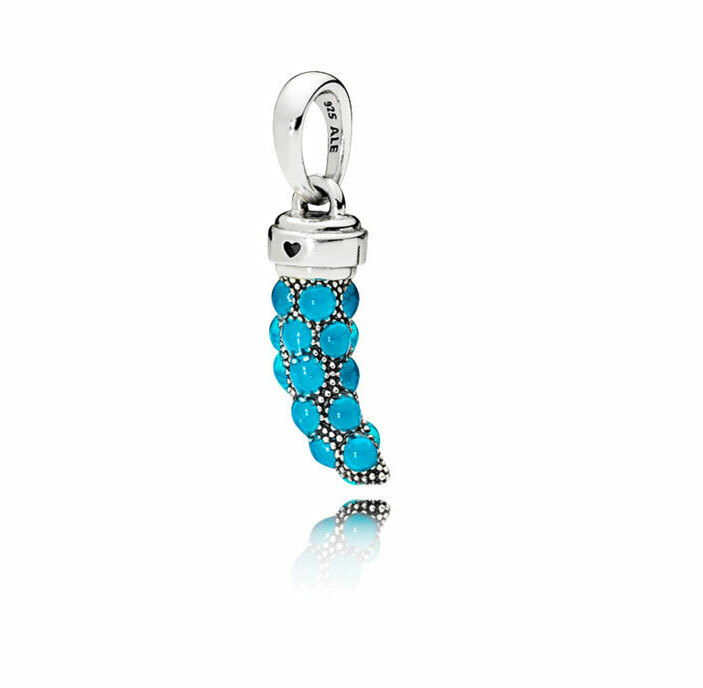 I think the tassel charms are quite fun and I’m happy to see different styles coming through from PANDORA. I really hope that is the last emoji charm though! Have you got your eye on anything from the Mother’s Day collection? I really like a lot of this collection. The skate board for my “son’s childhood” themed bracelet. The popcorn, the coffee cup, and the Ferris wheel are must haves. 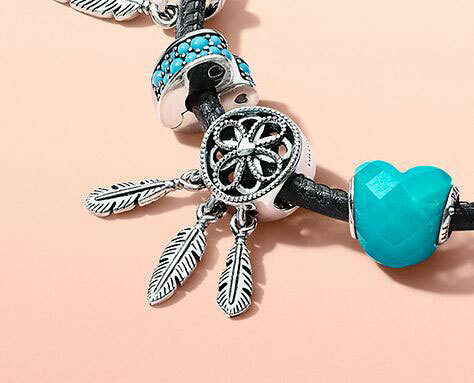 The turquoise heart and amulet with the feather and the dream catcher. The possibilities are awesome! Pandora has given us a variety of charms that still have a broad appeal, but are different from what we long time collectors already have. I love the freshness of this release. Love the popcorn! And the amulet, turquoise and orange heart bling! The feathers will be fun in AZ! I do wish the dream catcher had some color, but will wait for in person viewing before judging it for me. That hamburger is fun and so me on car trips and the compass might be a nice addition to that travel bracelet! Dora, thank you for the photos and the excitement begins. I just get rid of one season to overspend and here flies another right before me! Hi new to the blog. The coffee cup,popcorn ,love charm, burger and fries are must haves for me. I love the tassels and the color wheel too. 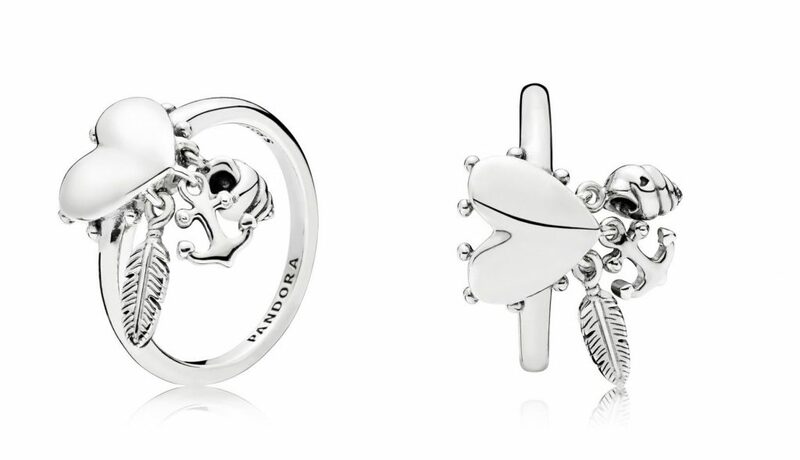 So glad Pandora is getting back to charms….😁.My wishlist for summer!!! Your Summer wish list is quite healthy! I’m glad you like the new collection. I’m quite interested in the Colour Wheel too and was thinking it might look cute with Disney charms. I’d like to see another angle of it. Do you have any guesses as to what the engraved message in the Burger & Fries Charm might be?! I am so so disappointed with their summer collection, I can”t express how I don’t like it at all It is too bohemian and I feel like I am 16 again… Like you … So strange.. Thank you for commenting and sharing your opinion. What would you have liked to see in the PANDORA Summer 2018 Collection? Did you like the Spring collection? Thank you for sharing your view. I quite like the bohemian aspect of the Summer Collection. I love vintage clothes and eclectic styles. The choker necklaces and ear cuffs are the pieces that really make me feel like a teenager again. But fashion goes around so it’s to be expected. At least you have more money to spend on the Spring and Mother’s Day collections if you know there is nothing for you in the Summer Collection! I’m loving a lot of the summer release and the leather slide bracelets are a must for me. Do you by chance know what the total length is on the leather slide chockers? Is the 38 cm total or is that just for the expanding sliding chain? Thank you for this review. Love the leather bracelets. 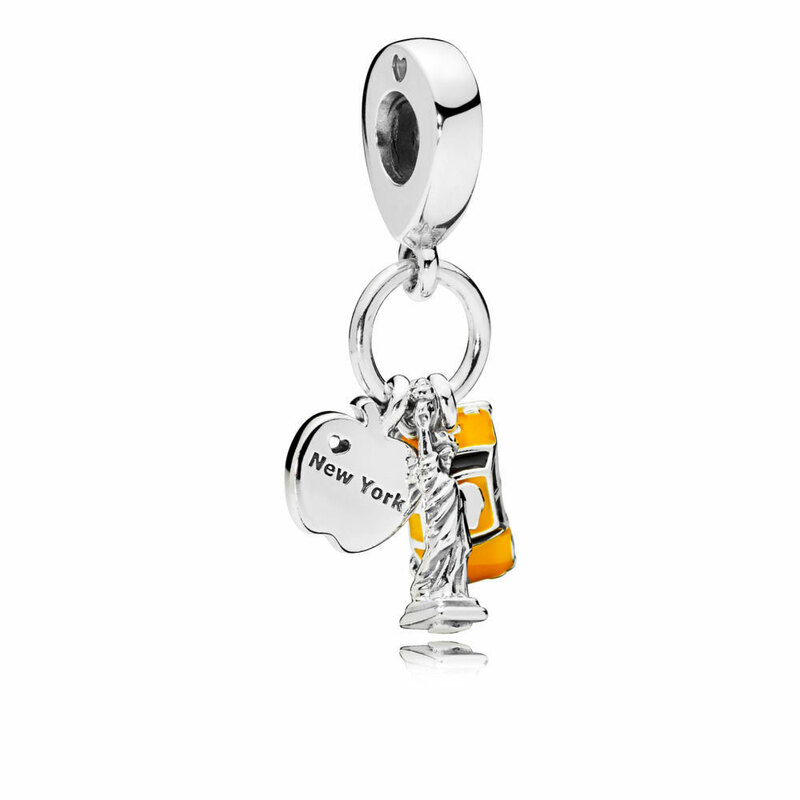 Big fan of New York so that travel charm combo is a must for me. The coffee cup is cute. Love the splash of colour the tassels provide. Thanks for the preview. I think the coffee cup is quite sweet but sometimes I would prefer it if PANDORA created two options for some of their designs; with enamel and without enamel. I do like the odd enamel detail but it can force you down particular colour ways sometimes. 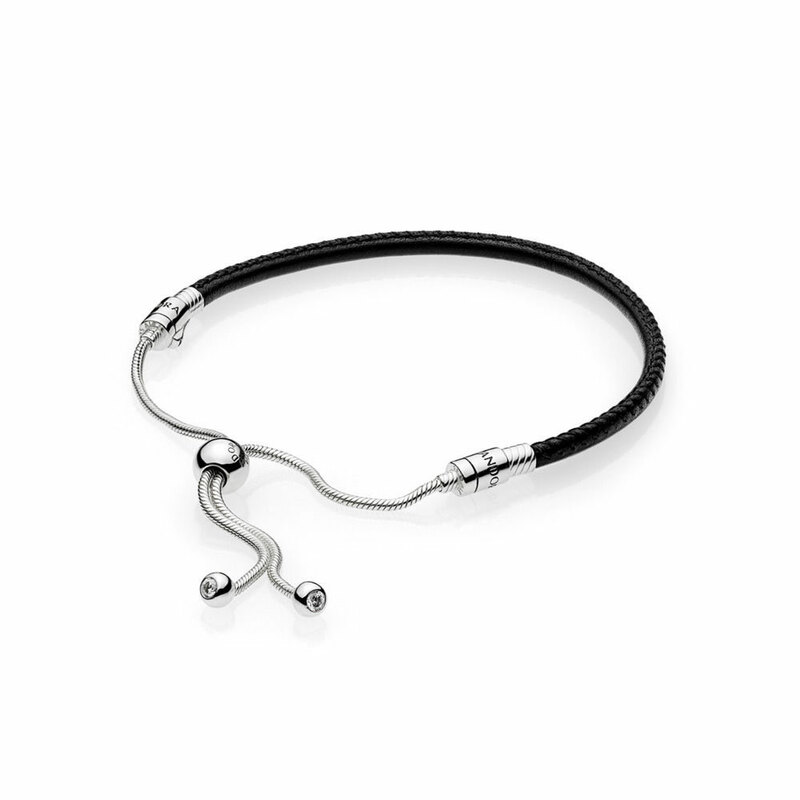 The Leather Bracelets are really lovely and I think they are a nice option for male PANDORA fans too. The new travel pendants are a fun idea! Are you happy with the icons on the New York Pendant or would you have chosen other items? Thanks so much, Dora! Yes I like the button leathers too, I saw those in the charm booklets. I am anxious for the leather slide. I have the rose gold slide, and love it! I need the silver and both leathers. I was sad to see that Troll doesn’t fit the slide bracelets, they fit the cuff bangle and I was hoping they would fit the slide as well. Thanks for keeping me up to date! Why not more emoji charms? This Stay Cool is my favorite in the entire collection. Personally I am not fond of the emoji charms but I’m pleased that you like them and that there is something in the PANDORA 2018 Summer Collection that you love. One of my favourite things about PANDORA is that it allows us to express ourself and our different tastes. 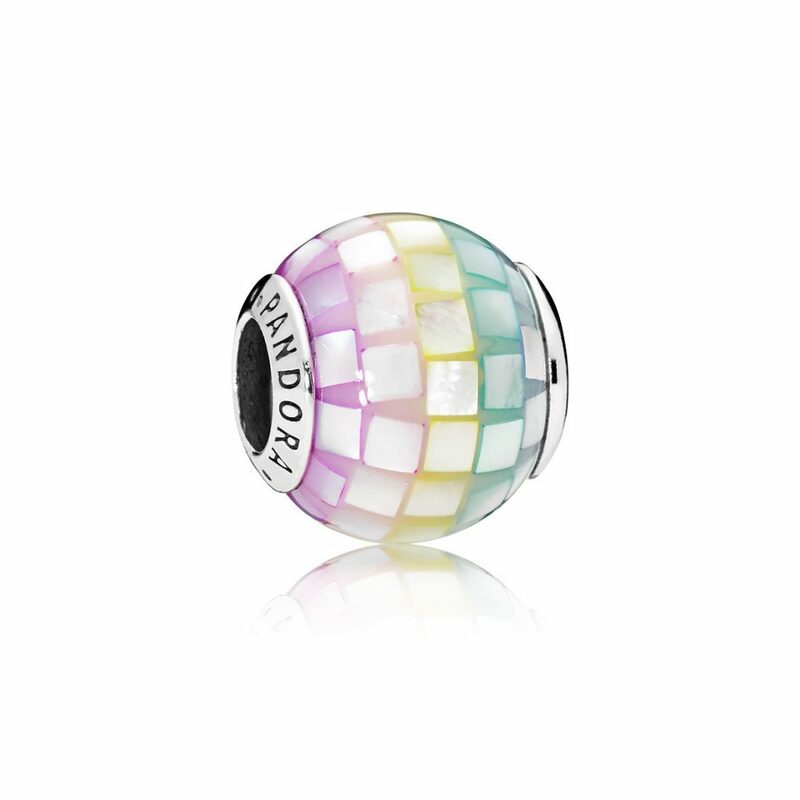 What other emoji charms would you like to see PANDORA produce? The Rainbow Mosaic is a moments charm. It’s very pretty isn’t it?